Plus Size Kitten: Stila KLCC restocks! I was at Stila KLCC from 5.30pm until 10.30pm. It was full of people and by 8.30pm it was 5 times the size of the above crowd (I could say roughly 50 people waiting). There's easily 100 over orders at hand. Those who walk in could place their order on a paper with their name and contact. Those who didn't have their orders void & if you're not there when your name is called, you will miss your turn. Therefore everyone was waiting patiently for the stock to come. The crowd grew bigger by the minute until Parkson's manager or supervisor (let's call him Parkson Man) was standing around glaring at the crowd. Possibly he was worried we will be "tahan" by the ISA for illegal assembly? haha. I was so worried too because the crowd is BIG! thank god not humongous. I talked to several of the girls and some of them waited from noon until now. Some of they gave up waiting and went home. I must say that the organization this time is much better than the 1st day mad sales which had no order list and people were everywhere trying to buy something. This time it was waiting for their orders to be called. The Stila SA made a perimeter around their counter just enough to fit boxes of stock and stand there to prepare the orders. Girls went back happy with their purchases, some a bit upset for waiting a long time, and some could not get their stock. Mostly everyone was happy as there's plenty of things to choose from and there is still stock for tomorrow, but don't game on best sellers as they're limited and might be already sold out like the smudge pot set. For dinner I ate 4 pieces of fish ball from Cold Storage & a bottle of coke & rushed back to the counter to help Lilian & Vincent out. I befriended 5 people know recognized me from my blog & sns. Very happy to meet them! Pls send me photo! huh..miu, u very keng...5.30-10.30pm. my fren also visit the counter...said almost 30 ppl Q at 8.30pm. wait until 9.30 still hv another 15 ppl Q. Should I try tomoro again ? sigh..not sure...can't take leave always..de. hehe..
just sent email to u, miu. ann: u should see VonVon, she waited from morning until 4pm. Then she give up n go home. Stock only arrived to counter at 8.30pm for orders to be released. As i order some stuffs and I am first to get my stuffs hoho. Also I helped guard the place a bit n help girls with their things. u have buy any xtra stuff? MIU IS THE BEST SHOPAHOLIC EVER! she got me the limited backstage palette..thank you, thank you, thank you...i'm so happy that i got all full items for my best friend's wedding hantaran. thanx to miu, she got me the important item. chir: got got.. but a few only. Harim: babe sob sob!! ur welcome! actually what happened was I met Harim at KLCC & shocked! coz we talked in email about the sales. I knew she wanted so much to get the backstage for her friend's wedding (which is a black & red themed wedding). The Stila Backstage red carpet palette is red & black too! She's so anxious about it. She had to leave to work around 8.15pm and I stuck around to get my orders which included the backstage make up. The MOBS were so many and I did earlier reserved from Stila a box and another box if there was extra. Incidentally a few boxes showed up when stock arrived so I let Harim have my extra backstage. I knew she wanted it very much for her friend's wedding and it would be the best gift ever! red n black! Harim, i hope u enjoyed today with me and I am glad to meet u. You're a good friend! sticking by since noon just to get the backstage palette. I am touched by your actions & I think u deserve to buy the backstage palette for your friend's wedding. So babe, you're welcome & pls update me about your friend's reaction when she gets your black n red gift! eyeshadow pot cream got what color? contouring trio is a 3 color pan palette for shaping/sculpting face. It has 3 shades for shaping face. This famous for making nose slimmer, longer, face slimmer, cheeks higher with use of the 3 shades. Must learn how to brush it on face for effect. Comes with instructions. Oh please please tell me you got a convertible eye colour for me?? Huhuhuhuh!!! I've been to Parkson Pavillion on Tuesday evening and it was so relaxing, so little people, I've been thinking to get few more stuff at KLCC, but after I read your post here, I think I'll pass this one. really2 wanted to get the Kajal eyeliner..
you think still got eh saturday? Saw you yesterday and today amidst all those ppl in Parkson KLCC. Managed to get a bunch of stuffs that I wanted, am a happy shopper indeed. Though I have been thinking to drop by Parkson Pavilion to see whether there are any more stocks left (hehehe). Anyhoo it’s really great to meet you there and hope to see you soon! I managed to speak to Lilian and she said can change for me. Btw, I just want to tell you girls, be careful and check the MFG date properly. Don't think they sell at counters and not warehouse sale means everything new and nice. I got an eyeshadow pot (pearl) today MFG in 2004!!!!!!!!!! Crazy!! And the Shine LIp Color in Sarah - the lipstick cacat one!!! after twist out, cannot twist back inside!! And i tried calling them from 1.30 pm to 3.15pm, nobody picked up phone. 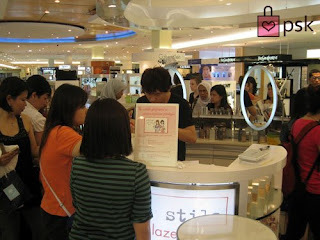 Finally, I managed to call the Lancome counter next to Stila's and got the girl at Lancome to call Lilian to the phone. Huh!!! 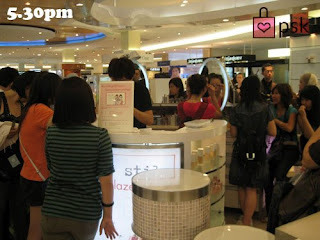 babe,when i showed my friend (Aishah) the advert at Stila counter of Backstage Beauty palette, she was thrill! she said that was awesome and she really liked it..
belum tengok betul2 punye lagi, the one that "we" got for her..i tertinggal it at my other friend's house, so when i met Aishah yesterday, the palette was not with me. but overall, she really excited about her Stila hantaran..huhu..yesterday, she bought the illuminating foundation. i bought a smudgepot (amethyst) and an illuminating all over shimmer liquid for face from parkson klcc last fri, however, these 2 products manufacturing dates are on year 2005....do you think they can still be used or should i change it?? since this is urgent question i shall stop my work for a while n respond to u! 2005 is very long! they can still be use, unless u have sensitive skin or prone to itchiness/redness/etc. But I wouldn't want to use products that's already been kept for over 3 years. U would still use probably 1 year to finish it. Total how old would the product be? 2. go & exchange it. Insist u do not know it's a 2005 product and u would like an exchange. If the item is out of stock, get other items or have them reserve for u when stock comes. fyi, bought some stilla stuff in brem park kepong and found that some products were cheaper compared to the price which u quoted!